With this form you can register at sentix. After sending the form you will receive an e-mail to confirm your e-mail address. How did you heard about us? What do you expect from sentix? If you give us a brief initial feedback here, you get a free analysis for a week! sentix Comfort is our Flatrate if you do not want to participate in the weekly sentiment surveys. sentix Comfort grants a non-commercial usage of our tools and services. 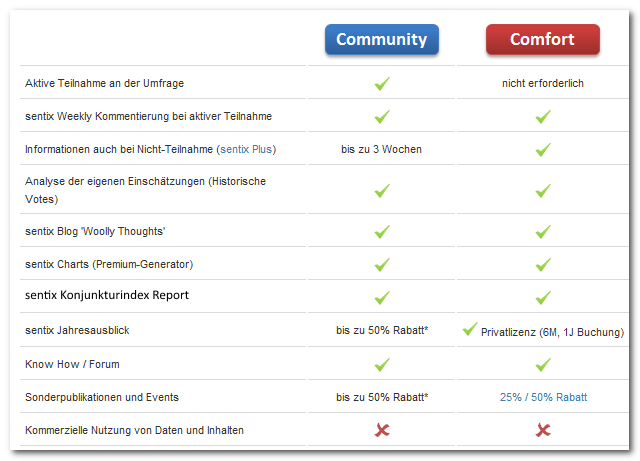 sentix Comfort contains all the benefits of sentix Community. No active participation in the surveys is required. Try sentix Comfort 1 month for a reduced fee. 1 month for EUR 24.95 + Mwst.